“Is it a ‘success’ having thousands of elderly, immobile people in care or nursing homes, with Parkinson’s or Alzheimer’s, post-stroke or myocardial infarction; blind from macular degeneration or deaf; incontinent and catheterised, unable to tend or feed themselves but living out some form of existence? I rather doubt it from a quality of life point of view, not to mention the strain it places on health and social care resources”. So said David Peddy, challenging MP Dr Sarah Wollaston’s celebration of increasing life expectancy. Bronwen Maddox, director of the Institute for Government and formerly an investment analyst in the City and on Wall Street, focusses on the argument that ‘we’ are about to see “the end of inheritance”, stating that the assets of the British middle-class will have to be spent on their own care in their later years. Ms Maddox adds that some MPs are suggesting that government try to encourage people to see the equity in their homes as a resource while prompting the financial services industry to develop cheaper, more flexible products for extracting it. Those concerned about care costs eating away their inheritances – and who do not wish to be ‘cared’ for – support assisted dying. It’s a win-win solution. I would like the right to die when I become too incapacitated to lead the life that I want. Hopefully when I get to that stage it will be generally available as it is in some other continental countries. “My brave mother, who could meet pretty much any challenge with her head held high, was brought low in the end. As her spirit faded, the one thing that still got her going was the law on assisted suicide. It infuriated her. She could not see why she should be kept alive, unwillingly and at great expense. She asked me several times to put a pillow over her head or take her to Dignitas, but I pointed out that I could be charged with assisting her suicide, and it would be tiresome for my children if I were jailed, so she gave up. But she never stopped complaining about the law, or sending money to Dignity in Dying, in an attempt to get it changed. “Her case, which she continued to put cogently to the end of her days, was twofold. The first argument was about freedom of choice. Our laws are, by and large, governed by the notion that people should do what they want so long as it doesn’t hurt anybody else. My mother wanted to die, but suicide is impossible for the old and frail, though for a while she tried starving herself to death. Why, so long as she was settled in her mind — something which an application to a judge, with a lapse of time between request and confirmation, could establish — would the state not make it easy for her to do what she wanted to do? 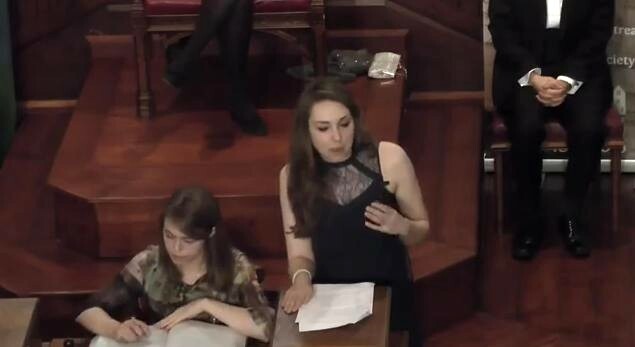 “When I would point out that changing the law might cause some suffering, of old people bullied into suicide by greedy relatives, for instance, she countered that Switzerland and the Netherlands, with liberal regimes, report no such problems”. Emma’s mother believed that the balance would shift heavily in favour of a law liberal enough to let even those without terminal diseases end their lives. Emma ended: “We will be cremating my mother’s body tomorrow, but to honour her spirit I shall take up the cause that she espoused. I believe, as she did, that change will come. And the sooner it comes, the better it will be for brave people who want to take control of their death rather than be vanquished by old age”. Assisted Dying 8: How long will government allow private health industry vultures and religious fundamentalists to prevail? “He did not have a good death”: these reticent words from a grieving widow were all that she felt able to say of the prolonged intense emotional and physical suffering her husband endured before his death. She added, “I have joined Dignity in Dying”. Another acquaintance last week told the writer that her father, in similar circumstances, had asked for strychnine to be procured for him. A condition not included in the demands of this organisation but recognised by medics and Dignitas as terminal, is dementia. Dementia is not just an enhanced state of memory loss – an inconvenience – but can adversely affect the whole personality. One who shared care of a formerly bright and independent relative with this condition for two years had to contend with extreme physical aggression, incontinence and refusal to wash. It is the core goal of Dignitas that one day nobody in the UK or any other country needs to travel to Switzerland for a self-determined end of suffering and life anymore. People who would opt for assisted dying when diagnosed with dementia, and who have made the declaration whilst still in good health, should be given every facility in their region. For years Scandinavian countries have had a range of acceptable provision and a few American states. Only Switzerland kindly offers this facility to foreigners. As respected journalist Simon Jenkins notes, an average of twenty people a month kill themselves ‘surreptitiously’ at home and two terminally ill people a month go to Switzerland to end their lives. At the moment the medical and care industries – a powerful parliamentary lobby – have a vested interest in prolonging the unhappy lives of such people, profiting by payments from their families and the state. The human right to control the circumstances of one’s own death was asserted by Dr Atul Gawande in a recent Reith lecture. Simon Jenkins wrote that right-to-die campaigner, Debbie Purdy’s life and death by self-starvation – forced on her by parliament – should be celebrated by the Commons passing the House of Lords’ “dignity in dying” bill forthwith. As he continues: an overwhelming majority of the public – 60-70% – wants it. The weight of legal and ethical opinion wants it. Eighty of the great and good writing to the Daily Telegraph at the weekend want it. Objection, he adds, is largely confined to religious prejudice and medical authoritarianism. “How much better if he were now able to thank parliament for relieving others of having to face the same ordeal”. 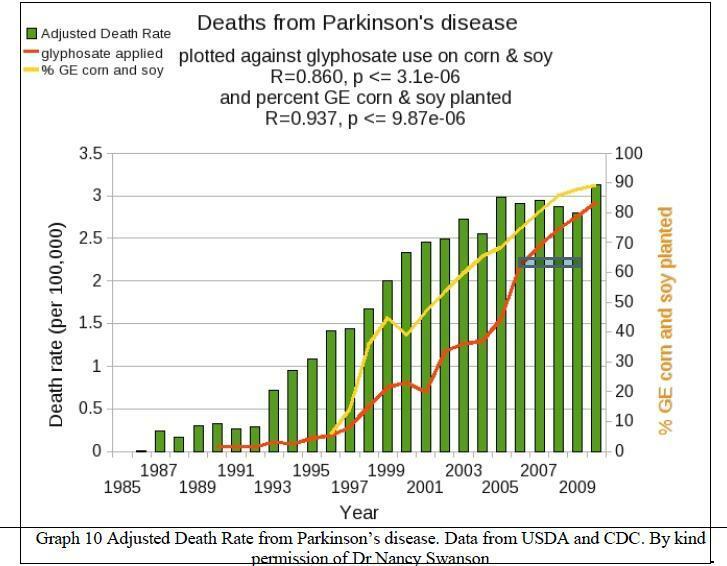 Is it a coincidence, that – as the use of glyphosate rises – so does the incidence of Parkinson’s disease, senile dementia, childhood autism, prostate cancer and many other conditions? 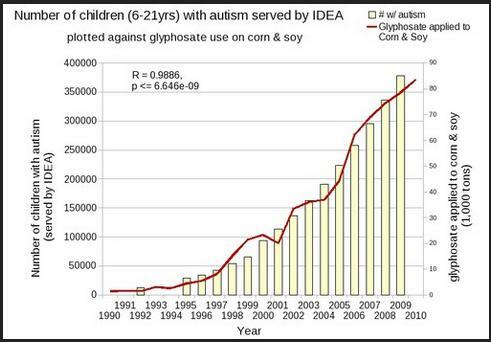 Glyphosate was first marketed in 1976 and its use has greatly increased since 1995, when it was first used with genetically engineered crops. GE crops absorb glyphosate through direct application, and from the soil. It cannot be washed off, is found in rivers, streams, air, rain and food (according to the US National Center for Biotechnology Information). 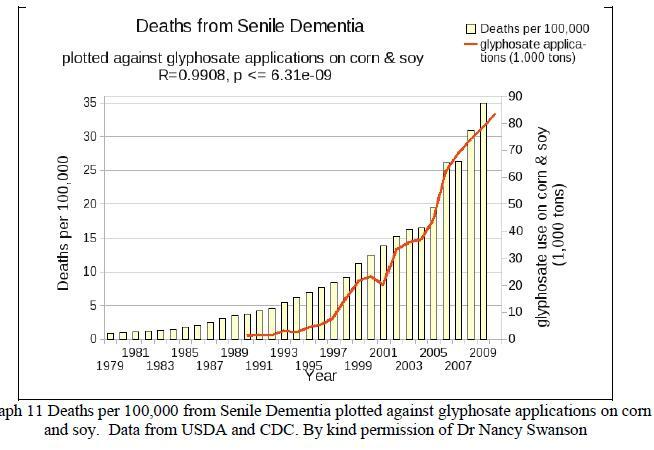 Graphs of death rates for Parkinson’s, Alzheimer’s and senile dementia have been plotted against glyphosate applications to U.S. corn and soy crops. Dr Swanson notes that the correlations are quite strong. American deaths due to Alzheimer’s have been rising since 1980, but there was a sharp spike in 1999. Dr Swanson points out that correlation does not necessarily imply causation and there are now a host of other chemicals in our food and our environment. “UK has an increasing number of cancers and neurological diseases such as Parkinson’s, Motor Neurone Disease and MS. We have just had our drinking water analysed in Germany and we have glyphosate in it and in our rivers! Wales, like Scotland has epidemics of type 2 diabetes, obesity and autism”. This water testing was a private initiative – in Scotland the water is not tested – see a FOI response to Graham White. Dr Mason says: “We asked the Environment Agency why the most used herbicide and the most used insecticide isn’t being measured in groundwater and they said it wasn’t necessary”. Though the presence of glyphosate in other British waters is also not tested for/recorded, Monsanto has commissioned a report on removal methods by Swindon-based Water Research Centre: WRc Ref: UC7374/14690-0 July 2007: WRC General Report – Roundup. Dr Mason notes that agrochemical corporations wield tremendous control over the British and American governments and influence the formulation of pesticide regulations – effectively controlling human health and biodiversity. 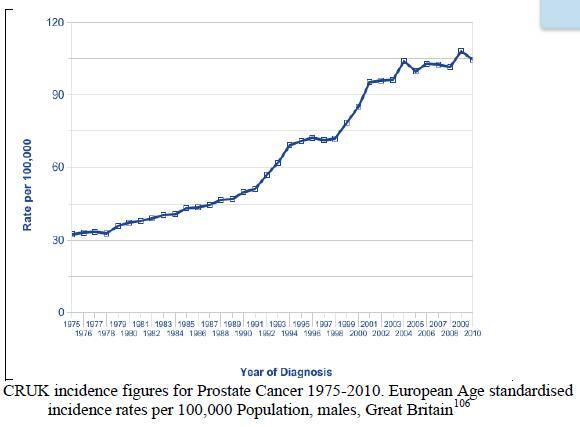 She presents a Cancer Research UK graph recording the incidence of prostate cancer in Britain; to the untutored eye the trajectory looks chillingly similar to the American graphs. “Syngenta is one of several chemicals companies which market biotech seeds and pesticides; AstraZeneca, its parent company, manufactures six different anti-cancer drugs mainly aimed at breast and prostate cancer. Dr. Nancy Swanson received her Ph.D. in physics from The Florida State University and then worked as a staff scientist for the United States Navy. She taught physics at Western Washington University and holds five U.S. patents. She is the author of over 30 scientific publications and two books on women in science. More detail here.